Flapping Eagle’s mystical, iconoclastic journey begins on a mesa near the reborn city of Phoenix. The city’s name fits with the American Southwest locale, with Rushdie’s many ornithological references, and with the novel’s cyclical mythology and cosmology — represented initially by the Phoenix and eventually by Shiva. When Rushdie writes that the city “had risen from the ashes of a great fire which had completely destroyed the earlier and much larger city also called Phoenix” (G 24), he subtly foreshadows the destruction and re-creation of Calf Mountain. One also suspects that Eagle’s initial name, Born-from-Dead, is meant to describe Shiva as well as the Phoenix, for the Hindu god creates new universes once he has destroyed old ones. Appropriately, this novel that ends with cosmic annihilation begins with rebellion and iconoclasm: Eagle’s sister Bird-Dog rejects the xenophobic rules of her Axona culture by daring to leave the confines of her homeland. In doing so she defies the taboo of the Whirling Demons. These spirits are reputed to surround the Axona Plateau, and they appear designed to keep Axonans in their isolation and on their moral high ground. The Demons represent alien, demonized cultures, and anticipate the “Foreign devilments,” the “Devil things from abroad” and the “items from hell” in Shame (S 99), as well as “the evil thing” and “the alien nation” so despised by the Imam in the Verses (SV 206). Bird-Dog’s successful descent through the feared realm of the Demons proves they’re merely fabrications of an ethnocentric culture. As she puts it, “They’re nothing at all but air” (G 19). Bird-Dog is the first to test the waters, and Flapping Eagle follows in her wake. From a feminist perspective it might seem heartening that Rushdie kicks off his iconoclastic fiction with a femme rebelle. Yet while Bird-Dog leads Flapping Eagle out into the world, she eventually suffers the subordinated fate of many other Rushdie would-be heroines: she's domesticated by Grimus, the man who rules Calf Mountain. Likewise, in Midnight's Children the Brass Monkey is domesticated and her voice is co-opted by a militaristic patriarchy. In Shame Rani and Bilquis are put under what amounts to house-arrest by their authoritarian husbands. Bird-Dog’s name anticipates her fate: she goes from living the free life of a bird to the chained life of a dog. While Bird-Dog’s name remains metaphorical, in Midnight's Children Saleem metaphorically and literally becomes a dog of war for the same militaristic generals who domesticated and co-opted his sister. Despite Bird-Dog’s final fate, she’s still the one who starts the pattern of rebellion against fixed patterns of culture and morality. She also, albeit unintentionally, leads her brother to Grimus, who attempts to perpetuate a spiritual hierarchy which makes slaves out of everyone — male or female. Before Eagle can destroy Grimus’ hierarchy, he must go through a number of tests. These don’t come so much in the form of outer perils – like the wolves or Malebranche in Dante’s Inferno – but in the less tangible form of stubbornly held concepts (or icons) that stop the mind from ascending to a freedom beyond fixed forms. The first such concept is cultural hierarchy, represented by the Whirling Demons that Bird-Dog prompts Flapping Eagle to defy. These whirling imaginary figures are the negative counter-parts to the more liberating whirling dervish figure of Virgil, who later on in the novel teaches Flapping Eagle the dance of liberation and annihilation. “Hodjapasha Culture Center is a beautifully restored Ottoman hamam (Turkish bath) in Istanbul's Sirkeci district now used for performances of the Mevlevi (whirling dervish) sema.” By Kemal.kubbe (Wikimedia Commons; image cropped by RYC). Other fixed forms that Eagle transcends are suggested by the various roles or personalities Eagle plays in the 777 years of his life so far. By the time he’s ready to leave for another world — to ascend the metaphoric Mountain that leads to the afterlife — he’s played so many parts in life that his self has become “nameless as glass.” He has become “Chameleon, changeling, all things to all men and nothing to any man. He had become his enemies and eaten his friends. He was all of them and none of them. … Contentment without contents, achievement without goal, these were the paradoxes that swallowed him” (G 31-32). In becoming “all things” and “nothing,” Eagle displays a version of Keats’ “poetical Character,” which “has no self — it is every thing and nothing — It has no character … What shocks the virtuous philosopher, delights the chameleon Poet. It does no harm from its relish of the dark side of things any more than from its taste for the bright one; because they both end in speculation" (Complete Poems, 608). Eagle is certainly more of a chameleon poet than the unnamed man he meets on the cliff. When he asks this man what he’s doing, the man “called back - and each word was the word of a different being: - I am looking for a suitable voice to speak in” (G 32). The man’s anxious mental searching is depicted metaphorically as a physical reaching: “As he called, he leaned forward, lost his balance and fell.” In contrast, Eagle displays something of Keats’ negative capability, that is, the ability to remain “in uncertainties, Mysteries, doubts, without any irritable reaching after fact & reason" (587). Most important to the novel’s epic design, Eagle’s early efforts to accept the mysteries in the world and in himself train him to keep an open mind. This openness will eventually allow him to confront the bizarre, dislocating dimensions of Calf Mountain without losing his psychological balance. Ultimately, it will allow him to soar to the peaks of the sacred Mountain and beyond. Eagle’s empty, open state throws light on the novel’s third epigraph, in which Ted Hughes’ trickster, Crow, appears as “his own leftover.” In another poem from Hughes, Crow’s “footprints assail infinity” and he makes a conscious choice to be used “for some everything. (Crow, 41). Rushdie may have had Hughes’ fine feathered friend in mind when writing the end of Grimus, for Eagle eventually enters a vague and infinite realm of “some everything,” a realm represented in part by the infinity of Attar’s Qaf and by Shiva’s infinite destructions and creations. Yet for the time being, Eagle’s emptiness makes him more like Attar’s bird pilgrim, who enters an ontological void where he professes to “neither own nor lack all qualities,” as well an epistemological void in which “All claims, all lust for meaning disappear” (Conference, 194, 184). Eagle’s ability to alter his fundamental conceptions makes him ready to ascend Calf, the island mountain which is as different from the contemporary world as is Dante’s island mountain of Purgatory from fourteenth century Italy. The Dantean elements of Eagle’s quest aren’t immediately apparent, for it’s the sinister Deggle and not the benevolent Virgil who initially serves as guide into the other world of the afterlife. Rushdie may be suggesting that since Dante’s Satan lives at the centre of the Earth, the devilish Deggle is best suited to lead Eagle down to the hole in the ocean which leads to the afterlife. Certainly he is the one that traditionally urges people to kill themselves. In any case, Deggle has taken centuries to find his escape route from this world, and with his advice Eagle drowns and successfully surfaces in “that other sea, that not-quite-Mediterranean” (G 36, 37). In echoes from both Dante (whose Ulysses drowns in the Atlantic) and T.S. Eliot (whose Wasteland reworks this ‘death by water’), Eagle drifts up from the nursery rhyme ‘hole in the bottom of the sea’ only to bump into the rocking chair of a strange, poetry-quoting man named Virgil Chanakya Jones. Virgil’s last name, Jones, may emphasize his commonness or mediocrity (he might be seen as a bumbling, pedestrian version of the great classical poet) or may emphasize his Britishness, in which case he is, like Rushdie, something of a hybrid of Indian and English origins. As Margery Fee (at The University of British Columbia) suggested to me, his surname may also refer to Sir William Jones (1746-1794), the Orientalist scholar who identified the link between Sanskrit, Latin and Greek. This makes sense given Virgil’s interest in language and in both English and Indian culture. Virgil’s middle name refers to a “very able and unscrupulous brahman adviser” in Maurya Dynasty India (Basham, The Wonder That Was India, 51). In Grimus Rushdie sees this historical Chanakya as a great ascetic, and in the Verses he sees him as a man whose detachment is so great that he “could live in the world and also not live in it” (G 133, SV 42). Virgil fits this description since he lives on Calf Island yet is philosophically detached from it, and since he practices the art of tantra, which is sexual and worldly as well as mystical and otherworldly. At this stage in the novel Virgil’s Englishness prevails. In some ways he resembles the absent-minded, poetry-quoting stereotype of the British schoolmaster. Yet his verbal bumbling alerts us to the increasingly complex ontology in the novel. His mutterings at first seem irrelevant, but one soon sees that they are very much part of the novel’s game. In particular, Virgil throws out a quote from T.S. Eliot’s Four Quartets, which Rushdie also includes in the novel’s first epigraph: “Go, go, go, said the bird.” Virgil calls this a “literary reference,” a “piece of self-indulgence” (G 52), yet his words are metafictional markers drawing the reader’s attention to an important explanation. So far, Rushdie hasn’t made it clear how readers should interpret the otherworldly Mountain of Calf, a realm which operates not so much according to laws of physics as of metaphysics. Virgil apologizes for his literary indulgence after telling Eagle that he must have realized, because of his “acceptance of immortality, for instance,” that the world is “no simple, matter-of-fact place”: the world is both “what it appears to be and not what it appears to be” (G 51) — something Chanakya would understand. 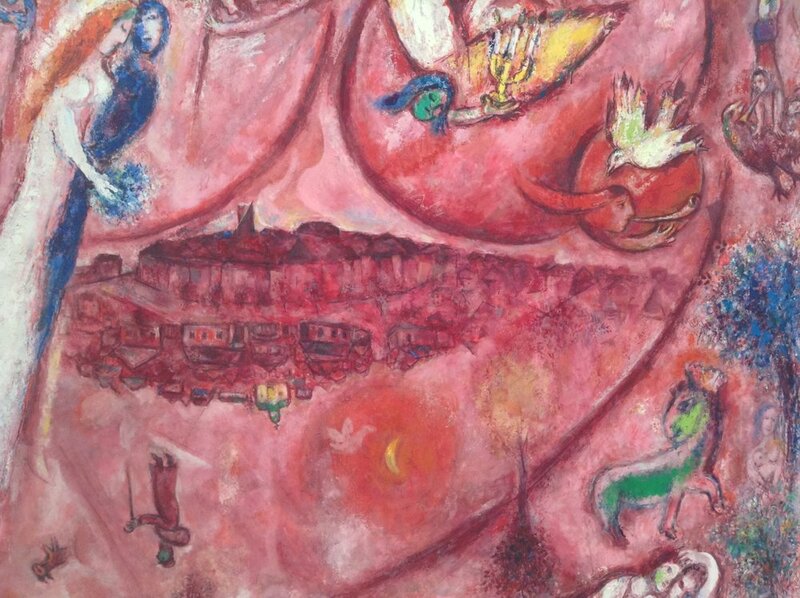 “Mon amant est pour moi un sachet de myrrhe, il nuite entre mes seins” (“My lover is for me a sachet of myrrh; he stays the night between my breasts”) by Marc Chagall, in Nice’s Musée Marc Chagall. Photo (slightly cropped) by RYC. The Mountain of Calf that Flapping Eagle eventually ascends is reminiscent of Borges’ library, Dante’s Purgatory, and Attar’s Qaf. Appropriately, the initial stages of Eagles journey resemble Dante’s Inferno, and the later stages resemble Purgatory and Paradiso. At the same time, his journey matches iconoclastic stages in Attar’s journey to Qaf Mountain. As the unknowable swept over me, I went all but mad. Hallucinations ... I thought they were hallucinations at first, but gradually they gained the certitude of absolute reality and it was the voice of Virgil Jones that came drifting to me like a dream. The world had turned upside down; I was climbing a mountain into the depths of an inferno, plunging deep into myself. (G 69-70). Many aspects of Flapping Eagle’s journey derive from Dante’s Comedy, which can be seen as both a journey across a cosmic topography and as a more psychological and symbolic journey into the hell, purgatory and heaven of the spirit. Throughout this stage of the journey, Eagle and Virgil feel uncertain, as do Dante and Virgil when they are in front of the city of Dis and when they reflect on their dangerous encounter with the Malebranche (Inferno IX 1-15, XXIII 1-57). The situation of Eagle and Virgil is more precarious, however: while Dante’s Virgil can count on the support of the omnipotent and benevolent Being above Purgatory, Virgil Jones doesn’t trust the novels’ would-be God-figure, Grimus, who skillfully manipulates (rather than helps) the people below him. The two menacing figures Eagle meets in his inner hell seem to come from a Batman comic or Road Runner cartoon, yet they also represent psychological, cultural and philosophical dichotomies. Deriving from Eagle’s childhood memories of life in a culture of dos and don’ts, truths and falsehoods, Khallit and Mallit embody the polarity of Axonan thought. More specifically, they take the form of cantankerous twins who engage in endless arguments about morality and mortality. They pretend to resolve these arguments, but instead merely revolve them by flipping a coin. In this sense, they might be seen as a menacing version of Lewis Carroll’s Tweedledum and Tweedledee. With each flip, the Road Runner canyon walls move toward Eagle like two sides of a vice. Left alone, he would die in this polar mindscape, yet fortunately Virgil performs his dervish-like dance of unity, his “Weakdance,” which makes the two extrapolations return “to the shreds of energy they had once been” (G 79). The next stage of Eagle’s spiritual journey resembles Cantos V - VII of Dante’s Inferno as well as Valleys Five and Six of Attar’s Conference. Cundy spells out several parallel with Inferno, noting that cantos V to VII give rise to Chapters 24 and 25, in which Virgil and Eagle enter a tunnel, Eagle defeats Axona, and both characters return from their journey within a journey. She also notes the important correspondence between the point at which Eagle and Virgil reach “the edge of the Forest of Calf” and thus enter “alternative states,” and the point at which the questing Sufi goes beyond the tree-line and enters a world without forms (Cundy 133). Another parallel occurs when Virgil and Eagle find themselves on a raft, moving “from anywhere to nowhere across the infinite sea … Towards infinity … where all paradoxes are resolved” (G 82). Their isolated yet unified state resembles that of the pilgrim soul in Attar’s Valley of Unity, a “place of lonely, long austerity” where the “many … are merged in one” (Conference, 191). After drifting in this fifth Valley and becoming one with the sea “where all paradoxes are resolved,” they return to a state of confusion, which corresponds to the sixth Valley, Bewilderment. Attar implores the pilgrim to wake and scourge the evils inside him, to “encourage them, and they will swell / Into a hundred monsters loosed from hell” (192). Likewise, Virgil tells Eagle that he must “leap” the obstacles that lie within him, for “Lurking in the Inner Dimensions of every victim of the fever is his own particular set of monsters. His own devils burning in his own inner fires” (G 84). This torture turns to questioning, as Eagle follows in the footsteps of Attar’s bird-soul who has lost “both key and door.” Awaking from a dream, Attar’s pilgrim cries out, “Was it a dream, or was it true?” He also asks, “Who am I?” and admits to himself, “I have no certain knowledge any more” (201, 200, 197, 196). In similar fashion, once Eagle returns from “the infinite sea” — once he realizes he’s still on the mountain slope — he not only questions where he is but also what it means to be in one place and not another: “Flapping Eagle awoke with a splitting headache. The words where am I? formed on his lips for a second time on Calf Island; he dismissed them with a wry twist of his mouth. Where is anywhere? he asked himself” (G 90). The first time Eagle asks “Where am I?” he has just landed on Calf Island (G 40) and he hasn’t yet been lectured by Virgil on the perplexing subject of infinite dimensionality. Now that he has listened to Virgil and has experienced one of these strange dimensions within him, he’s prepared to consider the wider question, What does it mean to be anywhere?